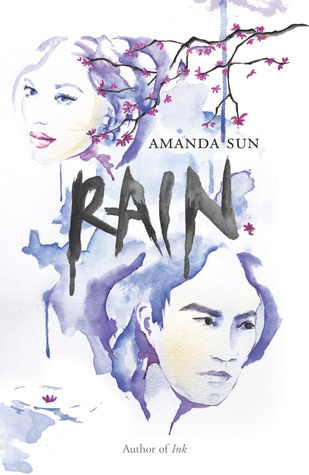 Rain is Amanda Sun’s sequel to Ink (I recommend you read that first). Sun’s urban fantasy is exciting and different from any other series I’ve read. The Kami mythology is intriguing and it was great to learn more about the powers and history. The idea of drawings and words that literally come to life is fascinating. Add the angst of competition, identity crisis, and doomed romance and you have a great novel for teens. Tomo’s drawings turning against him and those he loved seems like a metaphor that could be explored at length in a book club or essay. The contrast of beautiful scenery and gang violence, and intricate art and monstrous ink creates amazing imagery. The characters ruled by their jealousy and fears have back-stories that make the reader sympathetic. I sometimes struggled to keep track of who was who because of the cultural differences. Everyone calls people by different names because your relationship is reflected in the name you use. This would be really confusing for me and I’m glad Sun has Katie struggle with it too. I actually found the chemistry between Katie and Jun more convincing than the chemistry between her and Tomo. I’m not sure he ever did or said anything that made me feel like he was worth all the trouble they go through. However, I think this was partly intentional because there had to be some distance between them to create the love triangle- or hexagon if you consider all the people competing for Tomo’s and Jun’s affection not just Katie’s. 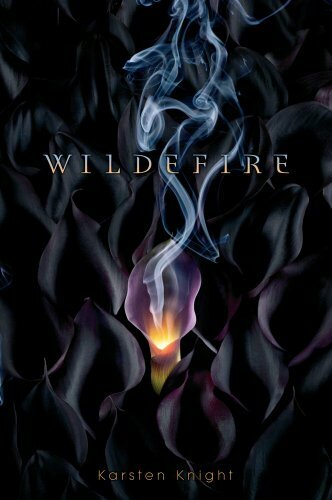 *I received Wildefire by the handsome young Karsten Knight from Simon & Schuster Canada. If you have an interest in mythology or in boarding schools full of supernatural students this is a good book for you. It’s multicultural and does a good job of portraying realistic adults – something I think a lot of YA is lacking. Parents, teachers and older love interests actually act their age, and they have legit responses to situations. I loved that it wasn’t just Greek myths Knight was drawing from- I do adore Greek mythology BUT there are so many wondrous lesser known myths of gods and goddesses that can be modernized. I enjoyed the variety of supernatural powers the teens had. Sibling rivalry, jealousy, rejection and all sorts of teen angst are thrown into the mix. Puberty is when people develop powers in this and so many other books and I think that’s because as a teen you have new “power” in the sense that you have more independence and your body isn’t quite under your control yet. So it isn’t such a stretch to think about what it would be like to have abilities going wild along with your hormones. 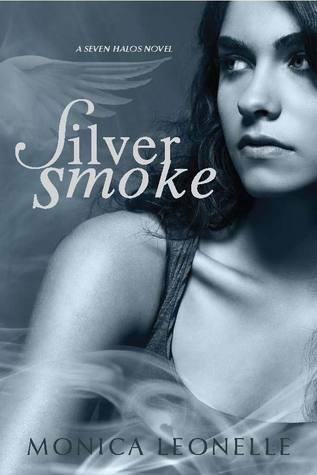 *I received Silver Smoke by Monica Leonelle from Spaulding House in ebook format for free. The mythology in this novel is much more developed than in other angel novels I’ve read (Hush, Hush & Fallen). I liked the concept of the Hallows and the Trinities. Hopefully in the next installment the Nephilim will be more predominant, because they are the part of the mythological backdrop that was the least fleshed out. The politics of the Hallows was interesting and I imagine that will be expanded on as well. Some of the mystical elements seemed inspired by Harry Potter but they were tweaked enough to be their own concepts. The three main character had realistic flaws and some nice depth. Pilot’s insecurities were great, and the chemistry between Brie and Rykken was fantastic for the first half of the novel. I was less impressed with the second half of the novel in terms of character development because everything was reactions to external forces rather than the nice inner conflict of the introduction. Even once I know a character I want to see their personality shine through the action. Minor characters were less believable. I thought Tessa needed more substance and Serena felt tacked in. Rykken’s story was the most compelling, and I will read on in the series to see what becomes of him. I really liked the names in this book, they were unique and original. I was fortunate enough to get City of Bones at a library book sale for criminally cheap. I can see why Cassandra Clare and Holly Black are friends (or at least seem like they are, I don’t know them personally – unfortunately!) because they have the same wonderful dark, sarcastic humour. The tone of their books are similar, with that edgy-funny feel to an action/adventure story with magic. The dialogue (especially in the first half) felt incredibly real; unlike the last couple of books I’ve been reading. These were more believable young characters in a fantasy than the characters in realistic fiction. I love that, when the magic and mythology doesn’t take away from the humanity of characters. The mythology of this series is certainly ambitious. So intricate! I don’t think I would want to take on so many types of supernatural beings in one novel, I’d spend half the time on exposition and bore the reader. Clare never bored me though, she wove the world around the story seamlessly. I had a hard time putting the book down, because I was so immersed in the world. This is a series I’ve been meaning to read for what seems like ages, and part of me regrets waiting so long to discover it’s level of awesome- but another part of me is glad because YIPEE I already own the next book and have the 3rd waiting for me at the library. That’s the beauty of being a latecomer to a book, you don’t have a long wait for sequels. I didn’t like the last fourth of the book nearly as much as the beginning. This was largely because I predicted what would happen and was disappointed to be right. I wanted so badly to be wrong about a certain plot twist!! I find it to be icky and reminiscent of the worst part about Star Wars (which I love anyway) and a lot of soap operas. 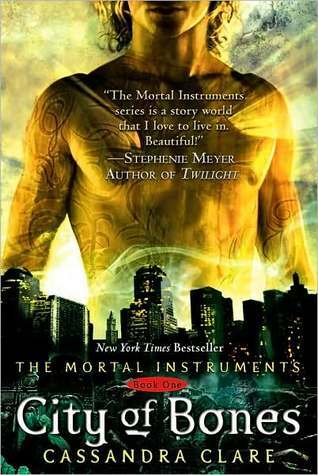 However, the plot twist I’m not a fan of was handled very nicely, and I’m still eager to dig into City of Ashes.